Woke up this morning to a Blizzard warning from local emergency management agency. We have snow and sustained winds of 30+ mph. Power has flickered a few times but we’re still operational at the moment. It's beautiful in West Seattle! I've got about 5 inches of fluffy snow sitting on top of my fence rail. Two blocks west towards the Sound it's about half that. Still coming down this morning and we could get a lot more over the next few days. Inland snow is much greater. Most snow in 20 years in the area and daily snowfall set a new all-time record at SeaTac. 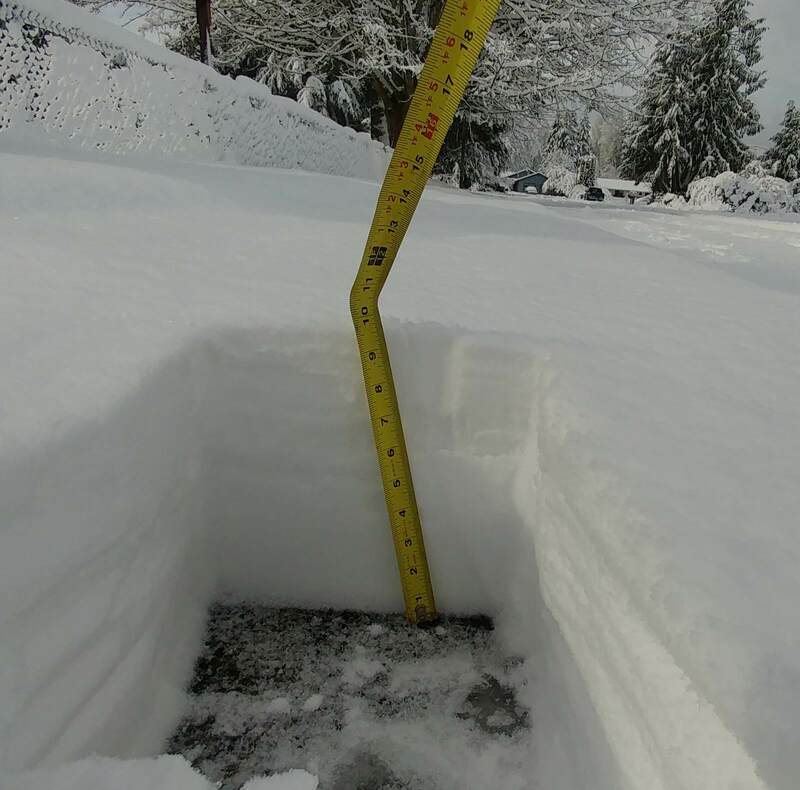 NWS Seattle says the snow ratio is 17:1; 2.5 inches of snow equated to only .17 inches of liquid which is unusually fluffy by our standards. My dog loved running around in it at 5 this morning; the quiet and pale pink light behind snow covered firs and cedars was wonderful. KUOW headline this morning: "As snow falls, Seattle stocks up on de-icer, avocados, and weed." Stay safe and warm out there and enjoy the beauty fellow PNW'ers. Eight to ten inches and lots of wind overnight on my place near Crater Lake. Intermittent whiteouts now, and we're expecting another few feet in the next couple of days. I heard that there was a run on kale. Maybe not true, but I’m not makin this up - it’s what I heard. How are you and family doing? I saw the forecast for the Yakima Valley - more blizzard conditions on the way. Hope you're all staying safe and warm - with electricity. I've been worrying a lot about people without shelter, we've had at least one death from exposure in Seattle. I lost power for about two hours last night. Props to PSE, it was one of the shortest outages ever. I guess the crews were already in the area, removed the tree/branch and dealt with the fuse/breaker. I was not expecting such a quick resolution with 400 other outages in the county. The lights came on about 10 minutes into in the process for preparing for a cold night with three layers of flannel pajamas and an extra comforter. It hit 6 F not too far away. Edit: I have been wondering about nwyaker, his posts have been sparse after the tornado went through. Edited 1 time(s). Last edit at 02/10/2019 12:40PM by Filliam H. Muffman. Actually had more snow hit the ground this morning than yesterday. The wind yesterday was unreal. Today is now cold and sunny. Until about 8. Then it snows again until Wednesday. Then we get a few hours break then it snows again through the weeekend. But that’s 7 days away. It might also be 85° by then. Here's what Cliff Mass has to say about it (Western WA anyway). Next week looks painful, lots of heavy wet snow, not the fun stuff. Yakima is looking at 8" of new snow in the next 48 hours. 1" tonight, 3" tomorrow, 4" the next night.